Not all overbites are the same. There are two types: vertical and horizontal. A vertical overbite occurs when the top teeth greatly overlap the lower teeth while a horizontal one develops when the top protrudes over the bottom. Some patients may have one or both forms. While they are often caused by alignment issues, it can also be from improperly developed jaws. Most overbites are the result of the shape or size of the jaw or teeth, such as from too little or too much room to accommodate the teeth. This can make the teeth crowded or gapped if it is not corrected. Other factors can lead to the problem as well, such as thumb-sucking, nail biting, or excessive pressure against the back of the teeth. In some cases, it can be the result of genetics, bruxism, or a disorder of the temporomandibular joint. Tooth decay, gum disease, worn enamel. Pain or discomfort when eating. Although it is never too late to fix an overbite, it is best to have it done as soon as possible. It is recommended children have an orthodontic consultation around the age of 7 to detect any malocclusion issues. Adults should have a regular checkup every 6 to 12 months to ensure prompt intervention to prevent complications from an untreated overbite. Your orthodontist in Arlington can correct it using a treatment that accommodates individual needs. Depending on whether it is a child or an adult that needs intervention, the process may vary. 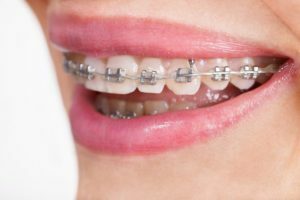 Whether you or your child need to correct an overbite, your orthodontist has the solutions you need to invest in a healthy, functional smile. Allheart Dental Implants & Orthodontics provide comprehensive solutions to help our patients reach optimal oral health and well-being. We can treat even the most complex alignment or bite concerns. If you need treatment for an overbite, we can help. Contact our office today to schedule an appointment.